As reported by Canadian Underwriter, Transport Canada (TC) and Defence Research and Development Canada (DRDC) recently conducted a field exercise designed to improve Canada’s response capabilities in the event of an incident involving a train carrying flammable liquids, such as crude oil. TC and DRDC, an agency of the Department of National Defence, conducted Exercise Athéna on Feb. 25 and 26 in Lévis, Que. The exercise provided a “unique forum for petroleum and railway industry experts and the first response community to improve effectiveness when responding to incidents involving a train carrying flammable liquids,” a TC backgrounder explained. On the first day, first responders attended in-class and field training where they learned about the Emergency Response Assistance Plan program and resources available from industry and TC. They also received information on the appropriate practices, strategies and tools to use when responding to a train derailment, including how to conduct a comprehensive site assessment; how to identify railcars that can carry hazardous material and dangerous goods placards (i.e. labels that appear on the side of train tankers which identify the hazardous substance or flammable liquid that is being transported); and an overview of basic railway operations during an incident, and specialized industry response strategies and tactics. On the second day, first responders were able to practice the skills and knowledge they received on the first day by participating in an exercise comprised of three rotations, with “industry instructors” providing guidance at each of the stations. The stations involved either a virtual reality application or a real life scenario. In particular, in the first scenario, participants faced a simulated train derailment. Using tablets, they had to conduct a comprehensive site assessment, including the following aspects: identifying the type of railcar based on its physical features and using the markings to identify the contents; making a preliminary damage assessment from a safe distance; and developing a risk assessment that takes into account the risk to life, health, property and the environment. In the second scenario, participants were faced with an actual fire using a replicated railcar prop. Participants were tested for the appropriate response strategies, techniques and procedures to use when dealing with this type of fire. The third scenario consisted of a combination of three interactive activities related to the government’s Emergency Response Guidebook 2016, gas detection and air monitoring methods and exposing responders to the different types of industry response equipment. The event will build on those from Exercise Vulcan in March in Maple Ridge, B.C. The most recent exercise is one activity supported by the Government of Canada to improve response capabilities following the 2013 train derailment in Lac-Mégantic, Que. The project is led by Transport Canada and funded through the Canadian Safety and Security Program, a federally-funded program led by DRDC’s Centre for Security Science, in partnership with Public Safety Canada. Partners in the exercise included: first responders from rural Quebec, Association des chefs en sécurité incendie du Québec, École nationale des pompiers du Québec, l’Institut maritime du Québec, International Safety Research, Suncor Energy, CN Rail, CP Rail, Railway Association of Canada, Genesee and Wyoming Canada Inc., Emergency Response Assistance Canada, MD-UN, GHD Canada, Williams Fire and Hazard Control, Inc. The owner of a dry cleaning establishment in Mississauga, Ontario recently plead guilty in the Ontario Court of Justice to one count of contravening the Tetrachloroethylene (Use in Dry Cleaning and Reporting Requirements) Regulations made pursuant to the Canadian Environmental Protection Act, 1999. An inspection of the dry-cleaning facility, conducted in January 2016 by enforcement officers from Environment Canada and Climate Change, revealed that a container, in which a residue containing tetrachloroethylene was found, did not have a secondary containment system, which is in contravention of the Tetrachloroethylene (Use in Dry Cleaning and Reporting Requirements) Regulations. The owner, Mr. Samy Iskander, was fined $5,000, which will be directed to the Environmental Damages Fund. Tetrachloroethylene, also known as perchloroethylene or PERC, is a chemical used in Canadian dry cleaning. Tetrachloroethylene can enter the environment through the soil, where it can damage plants, and it can find its way into ground water. On March 29, 2000, tetrachloroethylene was added to “Schedule 1: List of Toxic Substances” of the Canadian Environmental Protection Act, 1999. According to section 64 of the Act, a substance is classified as toxic if it may have an immediate or long-term harmful effect on the environment or if it may constitute a danger, in Canada, to human life or health. Environment Canada warns that human exposure to high concentrations of PERC can inflict a host of health issues, including eye irritation, memory loss and even liver and kidney damage. The department says PERC primarily enters the environment through the atmosphere, where it can damage plants, but it can also find its way into water systems, putting aquatic creatures at risk. Between 2005-06 and 2008-09, Environment Canada conducted more inspections for PERC than anything else. The substance remains legal in Canada, but users must follow regulations and keep machines in good condition. The British Columbia government recently re-issued Administrative Bulletin 3 which prescribes the administrative process for legal instrument applications being submitted during the regulatory transition period ending October 31, 2017, when the new numerical standards under the Stage 10 Amendment to the Contaminated Sites Regulation (CSR) will come into force. The new CSR standards are those included in CSR B.C Reg. 375/96 including amendments up to B.C. Reg. 253/2016, October 27, 2016. The Administrative Bulletin 3 bulletin applies to applications for legal instruments submitted to the Ministry of Environment (ENV) and to the Contaminated Sites Approved Professionals (CSAP) Society of British Columbia for high and non-high risk sites respectively. The CSAP Society of B.C. is an independent organization that accredits professionals to review environmental certification applications. The B.C. Ministry of the Environment recently made available the PowerPoint presentations and audio recordings from webinars it hosted on the amendments to the Contaminated Site Regulation and how they impact stakeholders involved in contaminated sites. Currently in B.C., there are over 14,000 contaminated sites being tracked in government records. This includes sites that are still going through the screening process (and are not yet confirmed as contaminated or not), sites being cleaned up, and sites confirmed as clean. Information on a specific site can be found by accesses the province’s database map of site investigations and clean-ups. The British Columbia (B.C.) Ministry of the Environment (MOE) recently canceled the environmental permit for Cobble Hill Holdings for the operation of its contaminated soil landfill. 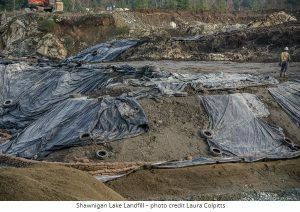 The landfill, located near Shawnigan Lake in British Columbia, had been use as a quarry. A consortium of companies own and manage the landfill. The companies include South Island Aggregates (SIA), Cobble Hill Holding (CBH), and South Island Resource Management (SIRM). The permit, issued by the B.C. Environment Ministry permits the disposal of approximately 5 million tonnes of contaminated soil at the landfill. In a written statement, Mary Polak, the B.C. Minister of the Environment stated, ““Effective immediately, I am cancelling the waste discharge permit for Cobble Hill Holdings because the company has failed to meet the requirements outlined in my Jan. 27 letter. “The company was given 15 business days to provide three required documents and submitted only two prior to the deadline given. Specifically, the company failed to provide the Province with adjusted financial security in the form of an irrevocable letter of credit. In the written statement, the Minister Polak further states that the company failed to respond to outstanding non-compliances and missed deadlines with respect to the permit. The letter further states that B.C. MOE are taking actions to ensure material on the property is managed in a way that does not present a risk to human health or the environment. The letter does not specify the exact nature of the actions. South Island Aggregates/Cobble Hill Holdings was granted a permit back in 2013 under the B.C. Environmental Management Act (EMA) to receive contaminated soils and ash and process it through bioremediation or landfilling, and discharge treated effluent to an ephemeral stream. The permit is specific to contaminated soil management activities. There has been fierce opposition to the landfill since that time. The landfill operation is occurring at a quarry operated by South Island Aggregates. The quarry operations are regulated by the B.C. Ministry of Energy and Mines under the B.C. Mines Act. There are approximately 100,000 to 200,000 tonnes of contaminated soil landfilled at the site. The Minister of the Environment would not comment on if it threatened local health and the environment. She said MOE technical staff would determine what would need to be removed. Research and Markets recently issued a market report on hazardous waste treatment and disposal lines. The report covers the years 1997 to the present and provides forecasts to 2020 and from 2021 to 2028. Included in the report is a description of the distribution (and by implication the marketing and sales) of Products. The data shows the geographic distribution of products that are consumed in the major Cities and Towns plus associated Distribution Functions, Structures, Costs and Margins. Data in the report is broken down by Distribution Values, Local Distribution, Per-Capita Distribution, Marketing Costs & Margins, Product Launch Data, Trade Buyers & End Users Profile, Buyer Demographics. Historic Balance Sheets, Forecast Financial Data, Industry Profile, National Data. Environmental Business International recently released a market report on the environmental testing and analytical services sector in the United States. The report provides an analysis of the markets, competition, customer needs, and technology, pricing and M&A trends in the $2.0-billion U.S. market for environmental testing and analytical services. This 326-page report is based on surveys, interviews and in-depth primary research on revenue generation, financial performance, and customer relationships of leading and emerging analytical services companies. · Detailed market breakdowns by customer type, sample media, service offering, competitor size, and state or region. · Primary research results of annual environmental labs survey by EBI and by TechKNOWLEDGEy Strategic Group. · Growth projections and factors for success in a competitive market. 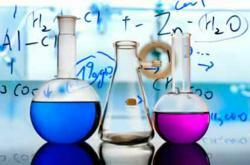 · Implications of new technology in the lab, field, data management, and customer service. · List of top firms, market share, ownership structure, and recent M&As. · Competitive analysis and changing share and ownership of top firms. Residential heating oil storage tanks have been used in Canada for over 65 years. Although many have now been decommissioned and the home converted to natural gas, the implications of owning a property that has a historical underground oil storage tank (a.k.a. “UST”) are potentially significant, especially if the underground oil storage tank has leaked. As this article will briefly discuss, the resulting costs to investigate and remediate the contamination can be very high and the liability exposure quite broad. Contaminated sites – including residential properties contaminated from leaking underground oil storage tanks – are governed by the British Columbia Environmental Management Act (“EMA”). Under the EMA, and specifically relevant to residential contamination, all current and previous “owners” and “operators” of the contaminated site are responsible for remediation of the contaminated site. The scope of responsibility also extends to neighbouring properties impacted by the contaminants. 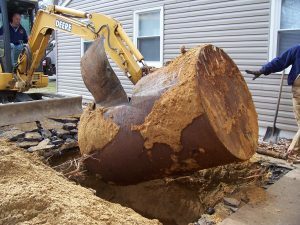 Therefore, if you purchase a property with an underground oil storage tank that has caused contamination (even if you did not own the property when the contamination was caused), you may be responsible for the costs associated with investigating and remediating the property and any impacted neighbouring properties as well. Of course, the costs to investigate and remediate a property will vary significantly from one situation to the next. However, many property owners are surprised to learn that it is not uncommon for the costs to reach as high as several hundred thousand dollars, especially in cases where there has been migration of contaminants and possible impacts under the foundation of the homes. CAN I GET REIMBURSED FOR THE ASSOCIATED COSTS? The EMA creates a statutory cause of action known as a “cost recovery claim” whereby a person who has incurred costs of remediation related to a contaminated site can recover such reasonably incurred costs from responsible person(s). Generally speaking, the costs recoverable under this cause of action include all costs to investigate and remediate the contaminants from the impacted properties. The key caveat is that the costs must be “reasonable”. The courts heavily rely on the opinion and recommendations of the environmental consultant when determining what costs are “reasonable”. Therefore, it is critical that a person undertaking such work retain a qualified environmental consultant to make any subsequent cost recovery claim against other potential “responsible person(s)” more likely to succeed. HOW CAN I GET EXEMPTED FROM RESPONSIBILITY? The scope of “responsible person” status, as indicated above, is quite broad under the EMA. However, the EMA also creates a number of exemptions. For example, there is an exemption that applies to an “innocent” purchaser of a property impacted by contaminants. To fall within the exemption, the person must establish that he or she had no reason to suspect the property was contaminated at the time of purchase and undertook all appropriate inquiries into the previous ownership and use of the property. This exemption is critical to potential purchasers of property where there is or is suspected to be a historical underground oil storage tank. Indeed, there are certain preventative steps that a potential purchaser can take to make it more likely that they fall within the exemption by, for instance, requiring a completed Property Disclosure Statement and requiring documentation if the tank was said to be decommissioned by a previous owner. Simply because a tank was decommissioned, does not mean that it has not caused or may cause contamination and, therefore, obtaining confirmatory documentation is important. In the end, there is the potential for significant inconvenience, costs and complications arising from historical underground oil storage tanks, either to the owner of the property or the owner of an impacted neighbouring property. As such, it is important that a person who owns a property with an underground oil storage tank or a person who is purchasing a property that may still have an underground oil storage tank (whether it is said to be decommissioned or not) fully understand the risk and issues that may arise. Investors, owners, and banks know that a Property Condition Assessment (PCA) is a must on every new commercial property purchase. Increasingly, these individuals are likewise recognizing the limits of the PCA to fully cover their potential liability. Along with reserve tables and code compliance reviews, many have begun to add the hazardous buildin2g materials assessment to their due diligence. Here are five reasons to do the same. Whether you plan to renovate immediately, change the property’s use, or simply want to understand the cost of maintenance and renovations down the road, a hazardous building materials assessment gives you critical information. Asbestos, lead paint, silica, PCBs, and mercury are among the most common hazardous materials that impact the cost of renovations, and even new buildings are likely to contain one or more of these materials. It pays to know which ones and how much of it is present, as well as what the likely remediation costs will be. Lead paint is usually only a problem when you disturb it, due to renovations. However, its presence can make the property unsuitable for use, particularly by child-occupied facilities such as hospitals, child care, and residential developments. If you plan to use the property for any of these purposes, it’s good to know in advance whether you’ll have an immediate problem to deal with. Mold can grow for a year undetected until the building changes hands and becomes occupied by that one sensitive individual. Suddenly, remediation becomes the problem of the new owner, even if the mold has been there for years. It’s also possible for hazardous materials that were previously contained to deteriorate and become a problem more or less on their own. For example, we did extensive remediation on the Ringling mansion, Ca d’Zan, after it was discovered that rats had disturbed asbestos-containing materials. The dust had been disbursed through the HVAC system, and coated every surface in the building. Remediation cost the property owner millions of unbudgeted dollars, and was required before any use of the facility could proceed. The presence of barrels, cans, bottles, or other containers of hazardous materials can become an environmental problem after the purchase. Current law holds that hazardous material disposal liability stays with the property—meaning that even if you did not create the situation, you are responsible for remediating it if you own the property. Further, undetected containers of hazardous material can deteriorate over time and create a larger environmental problem that will be even more costly to remediate. Knowing about the materials before you make the purchase allows you to remediate earlier rather than later—or to require the seller to perform the remediation. Discovering the presence of hazardous materials on a property is not usually a deal-breaker. Instead, having a thorough understanding of the building’s hazardous materials liabilities gives the buyer an opportunity to renegotiate terms to ensure they receive the good value for their purchase. In the event that the purchase decision proceeds with the expectation of renovations, lenders can often increase the value of the loan in order to cover the true cost of those renovations. Whether you’re a buyer or a lender, a hazardous building materials assessment just makes sense. You can talk to one of our assessment experts right now, or read more about hazardous building materials during renovation here. Bob Greene, PE, PG, CIH, LEED AP President As the founder and president of GLE, Bob Greene leads a highly diverse team of architects, engineers, environmental consultants, and construction experts to design fast and effective property solutions. He has served in the architecture, engineering, environmental consulting and remediation, and general construction arenas for nearly 40 years. This article was first published on the GLE Associates website. In mid-February, Lamor Corporation demonstrated an innovative new way to recover oil by deploying the Lamor Marine Oil Spill Sweeper LMOS 15 Speed Skimming system in Halifax, Canada in cooperation with their local representative, Griffin Engineered Systems, for leading Canadian response organizations and companies, represented by Eastern Canada Response Corporation (ECRC), Canadian Coast Guard, Department of Defense (DND), ALERT and RMI Marine. The demonstration in Halifax involved deploying the LMOS 15 (15 indicates the size of the opening in meters, it is also available in 25m, 40m and 50m) from a jetty, and towing the system with a single vessel and a paravane (the paravane floats independently of the vessel and is connected by ropes, and once under way, will hold the sweep system open). Once in the water, the observers boarded a second vessel which allowed them to see how the water flow was visibly slower as it moved through the LMOS Sweeper. 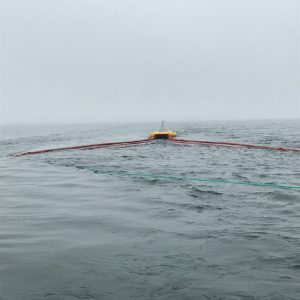 The system is designed to slow the velocity of the oil from 4.5 knots at the entrance, to approximately 0.7 knots in the collection pool, which allows the skimmer to collect and pump the oil back to the tow vessel. The observers at the Halifax demonstration were able to see how easily the LMOS was to maneuver through the water, even when changing directions, the parvane keeps it in formation. Although the Halifax demonstration did not include skimming of oil, a 2015 demonstration of the system in Norway did. During that demonstration, the LMOS Sweeper was tested by NOFO during their oil on water spill response exercise. During that exercise 45 m3 of oil was discharged and the LMOS Sweeper collected 43.4m3, a recovery efficiency of 96.4%. Despite the harsh weather conditions Halifax harbor that day, with winds up to 35 knots, including snow changing to freezing rain and ice pellets, while temperatures were ranging from minus 4°C to plus 6°C, the deployment of the LMOS 15 went well and proved the system’s effectiveness and recovery capacity in various climatic scenarios. Jacek Dabrowski, Marine Environmental Emergency Response Officer, OHM, from the Canadian Department of National Defence enjoyed the demonstration and thought that the equipment looked very promising. “Being able to demonstrate our equipment on location in the operators’ environment utilizing their people and resources is key to proving its ease of use and effectiveness,” said Dan Beyer, General Manager Lamor USA. One of the unique features of the LMOS Sweeper is the multi-barrier system consisting of deflectors in a herringbone pattern, used to concentrate the oil in the water and to lead the oil back through the system to the skimmer. These same multi-barriers help to prevent entrainment of oil under the barriers during turns or maneuvers. For those unable to attend the webinar hosted by the Canadian Urban Institute (CUI) on the Excess Soil Bylaw Tool for use in Ontario, the webinar recording is now available in the Workshops and Webinars section of CUI website. It can also be found on the CUI YouTube channel. The Ontario Ministry of the Environment and Climate Change (MOECC) has finalized the Excess Soil Management Policy Framework (the “Framework”). The goal of the Framework is to protect human health and the environment from inappropriate relocation of excess soil. The other goal of the Framework is to enhance opportunities for the beneficial reuse of excess soil and to reduce greenhouse gas emissions associated with the movement of excess soil. The Framework provides principles to guide policy and program development; has a description of existing policy and current roles and responsibilities; and details policy needs, actions and priorities. The Framework recognizes excess soil as a resource and promotes a system which strives for environmental protection, local beneficial reuse, consistency, fairness, enforceability, and flexibility. Management of excess soil is a growing concern in the Greater Toronto Area (GTA) and rural municipalities surrounding the GTA. The issue has received media attention with a focus on illegal dumping of soil, site alteration by-laws, commercial fill operations, tracking excess soil, concern over the quality of excess soil, and protection of the environment, water, and agriculture. Of interest to municipalities is a by-law language tool that can be used in the development and updating clean fill and site alteration by-laws. As part of the initiative, the Ontario Ministry of Municipal Affairs (MMA) has introduced legislative amendments to the Municipal Act which includes a proposed change to allow site alteration by-laws to apply in conservation authority regulated areas. Since the draft framework was posted for input, significant progress has been made on several of the proposed actions. For example, a by-law language tool has been prepared by the Canadian Urban Institute, with support from the Ministry of Municipal Affairs (MMA) as a resource for municipalities in developing or updating fill and site alteration by-laws. 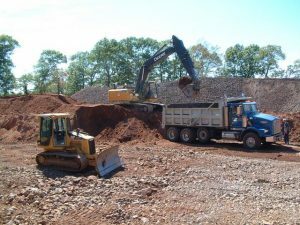 Of interest to quarry owners and operators is the fact that the Ontario Ministry of Natural Resources and Forestry (MNRF) has introduced proposed legislative amendments to the Aggregate Resources Act, which include increased authority to make future regulations about record keeping on aggregate operations e.g., fill records. To support integration and implementation, work is underway to examine market-based tools and programs to encourage reuse, and several MOECC-organized working groups have been established to support framework finalization and delivery, including the Excess Soil Engagement Group. Managing excess soil in a responsible way is integral to building sustainable communities. Improper management can result in impacts to ground or surface water quality and/or quantity, natural areas and agricultural lands, and cause several local issues including concerns regarding noise, dust, truck traffic, road damage, erosion, drainage and other social, health and environmental concerns. Proper management of excess soil can result in benefits to the environment and economy.